In Kenya, it’s not always easy to find out what elected representatives are up to. As you might expect, the official Kenyan parliament website provides a list of MPs. Rather more unexpectedly, more than 50% of MPs are missing from it — and details of their constituencies have not been updated to reflect boundary changes made in 2013. But the Kenyan citizen’s need for information is great. There’s a history of corruption in the country, with some MPs siphoning off resources intended for the public good, and bribery commonplace at all levels of administration. At a more fundamental level, it’s not always easy to look up where your nearest constituency office is located, who your MP is, or how to contact them when you need help. 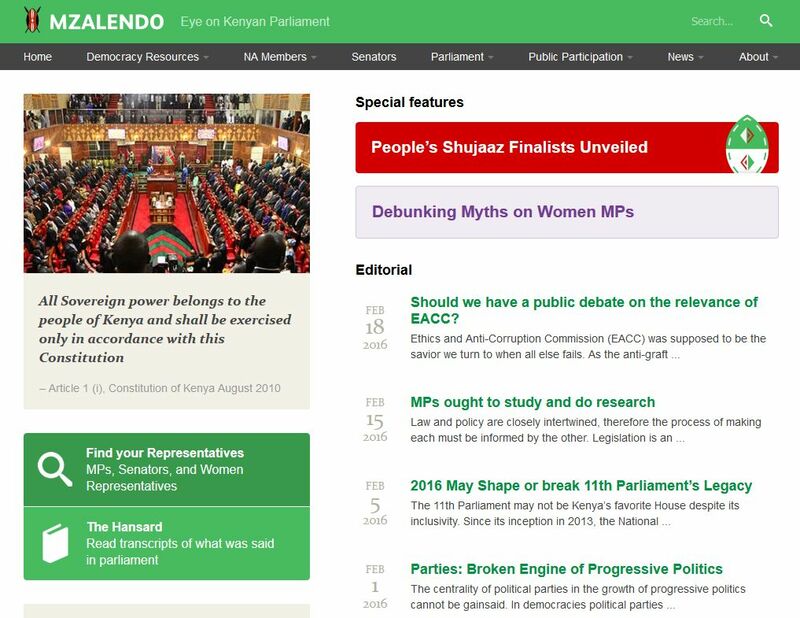 Mzalendo, which means ‘patriot’ in Swahili, launched in 2005 as a non-partisan parliamentary monitoring website for Kenya. Its mission? 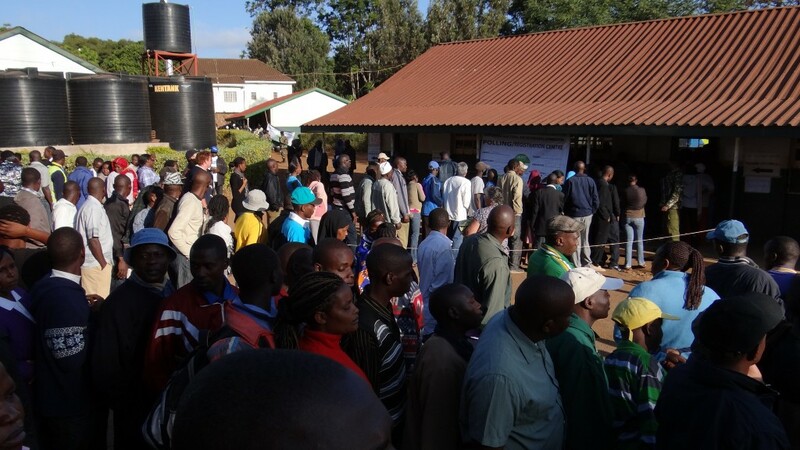 To give a voice to the people, and increase public participation in politics. In 2010, Mzalendo received funding from the Omidyar Network (now Luminate) which allowed for improvements and additions to the site, in partnership with mySociety. We worked with Mzalendo to relaunch it on the Pombola platform, adding richer content. These include ‘scorecards’ for each MP to assess their attendance, contactability and spending performance, and publication of Hansard, the official record of debates. Visitors to the site can also comment on MPs’ or parties’ pages. Additionally, a MapIt installation allows users to input their location and access information about their representative and nearest constituency office. 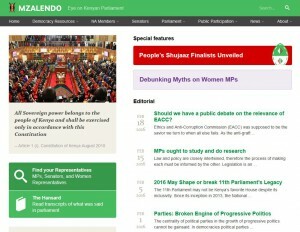 Mzalendo publishes a lively blog, information about subjects such as the contribution of women to the Kenyan Parliament, and an explanation of how democracy works. Since its relaunch, Mzalendo’s audience and impact has steadily grown. Word was spread, in part, by those MPs who received high ‘score cards’: naturally, they were keen to broadcast this fact via social media. The site frequently inspires front-page stories in the national newspapers, on issues such as the attendance levels of MPs. And if commentary from avid readers (on the site as well as on Twitter and Facebook) counts as increased political engagement, Mzalendo has certainly achieved its initial aim. But Mzalendo won’t be stopping any time soon: there are still more people to reach, more data to gather, and of course an unending stream of parliamentary activity to cover. And for elections, Mzalendo will provide a solid, reliable source of information. In 2014 Mzalendo became an independent trust. mySociety continues to provide technical development and support to the project.